The Eggleston Park Food Forest is a diverse planting of perennial edible trees, shrubs and herbaceous plants— including fruits, vegetables, nuts, and herbs—designed to mimic the natural balance of a forest by utilizing permaculture principles. If you have been volunteering with Edible Evanston you have, no doubt, been hearing about “Permaculture.” But what is it? Most of the techniques applied by those working with permaculture aren’t revolutionary, they are evolutionary. But the way of looking at the world—and I mean that in the broadest sense—often feels revolutionary. Permaculture becomes a way of framing one’s outlook. And that can be applied not just to agriculture, but also to architecture and engineering, to urban planning, and to societal questions. 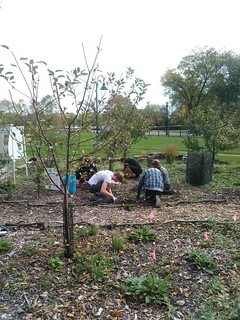 Fall 2016 marked the beginning of Edible Evanston's conversion of the Eggleston Anniversary Orchard into a Food Forest. With the initial planning done, Spring 2017 is when the real work begins. Learn more about Grant News: A food forest is in our future! An orchard was designed and constructed in Eggleston Park (McCormick Blvd & Bridge Street, Evanston, Illinois, 60201) as joint project of the Northwestern University Brady Scholars (Brady Scholars) and the New Leaf Urban Garden (NLUG), with support from Edible Evanston (EE) and the City of Evanston (City) Parks and Recreation Department (Parks Department). This is the first orchard in an Evanston City Park. The new orchard, constructed in May and June 2013, includes nearly 50 fruit and nut trees and nearly 30 raspberry bushes.